Glasses can accumulate dust, dirt, and smudges throughout the day. Whether you use your eyeglasses occasionally for reading or you are wearing them all day long, it’s important that you are careful to protect the lenses. Your eyeglasses are an investment, so it makes sense to be proactive with care and cleaning. The first step to cleaning your lenses is to make sure that you are starting with clean hands. Having grime or dirt on your fingers means that you might transfer these compounds to the glasses. Next, rinse the lenses under lukewarm water. Use the spray cleaner that you received with your glasses to clean the lenses. Or, you can use a drop of liquid dish soap on your fingers to gently rub away the buildup. Make sure to wash the lenses, nose pads, and frames. 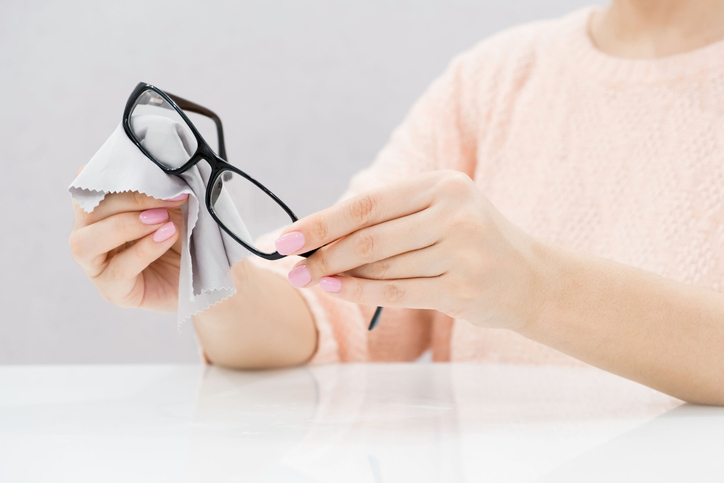 Finish by rinsing with warm water again and dry the eyeglasses with a lint-free cloth. During the day, you can keep a lint-free cloth in your glasses case for a quick touch-up as needed. If you notice a fingerprint, spot, or dust on the glasses, then rub the cloth on both sides of the lens so that you can see clearly. Cleaning with Your Shirt Hem: It might seem inconvenient to grab a lint-free cloth, so you could be tempted to use the bottom of your shirt to wipe the lenses as needed. But clothing can damage your glasses because of small pieces of dust or dirt that can scratch the lenses. Also, avoid using napkins, paper towels, tissues, and other paper-based products. Using Harsh Cleaning Products: Never put harsh cleaners on your glasses because the ingredients could damage the coating on the lenses. For example, you should avoid using window cleaner, ammonia, bleach, and vinegar. The Water is Too Hot: It is best to set the water temperature at lukewarm. Hot water can damage certain types of lens coatings. If you have questions about caring for your lenses and frames, then you can talk to our team for recommendations. Stop by one of our nearby offices: our Temecula office at (951) 302-1331 or our Murrieta office at (951) 600-9226.